Draft: 2011, New York Mets, 1st rd. Brandon Tate Nimmo graduated from Cheyenne East (WY) High School where he played American Legion ball for Post 6 because his high school did not have a baseball team…He won the MVP at the 2010 Under Armour All-America Game at Wrigley Field…Also played football and ran track in high school...Became the first-ever first-round draft pick from the state of Wyoming...Became the 16th player born in Wyoming to play in the major leagues...Committed to the University of Arkansas before signing with the Mets...His father wrestled collegiately, while his brother was an outfielder for four years at the University of Nebraska, playing in the 2005 College World Series...Was Santa at the Mets annual Kids Holiday Party in 2017 and 2018...Appeared as an elf at the Mets annual Kids Holiday Party in December, 2016 to help hand out presents to children...Participated in the inaugural Kids Holiday Shopping Spree on December 14, 2016 at Target in College Point, Queens...Helped children pick out holiday gifts for them and their families...Attended New York Governor Andrew Cuomo's New York State of the State in Albany on January 4, 2018...Received the Ben Epstein/Dan Castellano Good Guy Award at the New York BBWAA Dinner on January 26, 2019. Made his first Opening Day roster...Optioned to Las Vegas (AAA) of the Pacific Coast League on April 10...Recalled on April 13...Was on the Disabled List, August 20, retroactive to August 17-August 28, with a bruised left index finger...Strained his right hamstring on September 29 and did not play again in 2018...His .404 OBP was the second-best in the NL and fourth-best in the majors among qualified batters and his 80 walks were ninthmost in the NL...Was the first Mets player to finish the season with an OBP over .400 since David Wright, who had a .416 OBP in 2007. • Finished the season with an .886 OPS, the 11th-best in the NL... His eight triples were tied for fourth-most in the NL...Became the eighth Mets player to record a bWAR of at least 4.0 and a .400 OBP joining Keith Hernandez and John Olerud (3x each), Mike Piazza, Cleon Jones, Dave Magadan and Edgardo Alfonzo...Became the 10th Mets player age 25 or younger to post a 4.0 bWar...Drew 29 walks in September, second-most in the majors and the most walks in a calendar month in team history (passed Keith Hernandez, 28 in July 1984)...Walked at least once in 14 of his last 17 games and had at least one walk in nine-straight games from September 13-21, a career-best streak...Reached base safely in a career-best 28-straight games from August 11-September 21 and in 35 of his last 36 games...Reached base safely in 10 consecutive plate appearances from August 14-16...Tied with Benny Agbayani (2000) and Todd Hundley (1997) for the second-longest streak in team history... John Olerud reached base safely in 15 straight PA in 1998...Had 22 HBP, most in the majors and a single-season club record (passed Lucas Duda's 14 HBP in 2015)...Reached base safely in eight straight plate appearances from May 23-24...On May 24 at Milwaukee, reached in all five of his plate appearances, going 4-4 with a walk...Hit his 10th homer of the season with a two-out, go-ahead homer in the ninth inning on June 17 at Arizona with the Mets trailing 3-2...The last Met prior to Nimmo to hit a go-ahead home run with the team trailing in the ninth inning or later with two outs was Lucas Duda on September 27, 2014 vs. Houston (off Tony Sipp)...Tallied his second career multi-homer game (also September 7, 2017 vs. Cincinnati) and a career-best four RBI on June 18 at the Rockies... Hit a leadoff inside-the-park home run for his first homer of the night...The leadoff inside-thepark homer was the third such homer in Mets history...The other two were hit by Angel Pagan on August 23, 2009 vs. Philadelphia and Charlie Neal on May 7, 1963 vs. Philadelphia...With his inside-the-park and over-the-fence home runs on June 18 at Colorado, Nimmo became the fifth-Met to have such a game and first since Angel Pagan on August 23, 2009...Blasted his first career walk-off and pinch-hit home run with his pinch-hit, walk-off three run homer on July 11 vs. Philadelphia...Was also his first career walk-off RBI...Went 3-5 on August 8 vs. Cincinnati with three doubles, three RBI and three runs scored...The three doubles tied a franchise-best for a single game (29th time)...Turned in a career-high five hits on August 15 at Baltimore, going 5-5 with two doubles, one triple, three RBI, three runs scored and a HBP...Had a career-best seven-game hitting streak from August 13-31...Went 15-27 (.556) with four doubles, two triples, a homer, five RBI and a 1.563 OPS in that span...Hit his second pinch hit go-ahead home run in the ninth inning on September 3...Joined Jordany Valdespin (2012), Chris Jones (1995) and Marv Thorneberry (1962) as the only Mets with multiple pinch-hit, go-ahead homers in the ninth or later in a season. Began the season on the 10-Day Disabled List (right hamstring) and was optioned to Las Vegas (AAA) on May 16...Was recalled from Vegas on June 16 before landing on the 10-Day DL on July 8 with a partially collapsed lung (retroactive to July 5)... Activated from the DL on July 28...Established career-highs in games played (69), hits (46), doubles (11), triples (one), home runs (five), RBI (21), runs (26), stolen bases (two) and walks (33)...Had the fourth-best on-base percentage (.379) among major league rookies (third-best among NL rookies)...Trailed Aaron Judge (.422), Rhys Hoskins (.396) and José Martinez (.379)... His 33 walks were seventh-most among NL rookies...Had 15.3% walk rate, which was tied for the 10th-highest among players with 200 or more plate appearances...According to Statcast, he swung at 13.3% of pitches outside the strike zone, the third-lowest among more than 400 hitters who saw at least 250 or more pitches out of the strike zone...Batted .281 (38-135) with nine doubles and all five of his home runs vs. righthanded pitching...Was 5-16 (.313) with two doubles, two RBI and four walks as a pinch-hitter...In his major-league career, Nimmo is a .393 (11- 28) hitter as a pinch-hitter...Reached base safely in all four of his plate appearances on August 23 vs. Arizona...In doing so, Nimmo became the fourth rookie in franchise history to start in the leadoff spot and reach base safely in every plate appearance with at least four times up to bat...The other rookies to accomplish the feat were Mookie Wilson (1981), Gregg Jefferies (1989) and Kazuo Matsui (2004)...The last rookie on any team to do so was Washington's Trea Turner, on August 23, 2016 at Baltimore... Research courtesy of Elias...Reached base safely in a career-best 10 straight games from August 27-September 5...Turned in his first career multi-homer game on September 7 vs. Cincinnati...Finished the day 3-4 with three RBI and three runs scored...His three hits and three RBI matched his careerhighs while his three runs scored were a new career-high...Was the second Mets rookie with two homers from the clean-up spot...Jesse Gonder also did so on July 11, 1963 vs. the Dodgers at the Polo Grounds...Played for Team Italy during the 2017 World Baseball Classic (three games)...Suffered a strained right hamstring while playing for Italy. Began the year with Binghamton (AA) of the Eastern League…Promoted to Las Vegas (AAA) of the Pacific Coast League on July 28...Was on the Disabled List from May 16-June 14 with a sprained left knee...Played four rehabilitation games with St. Lucie (A) of the Florida State League from June 14-June 17... Participated in the SiriusXM Futures Game in Cincinnati on July 12...Went 1-for-2 with an RBI and a run scored while playing centerfield....Named to the mid-season Eastern League AllStar team...Compiled a .297 (41-138) batting average in 34 games in April and May while playing for Binghamton....With Binghamton, he hit .281 (59-210) vs. righthanded pitching and .271 (16-59) vs. lefthanded pitching...Put together one, four-hit game at New Hampshire on June 20 (4-for-5), 15, two-hit games and, four, three-hit contests....Hit safely in 14 straight games from May 9-June 25 (.383, 23-60)... Was 19-64 (.297) with three home runs vs. righthanded pitching after his promotion to Las Vegas (AAA) of the International League....Went 4-5 with a home run and two RBI vs. Tacoma on September 4. Spent the entire season at Savannah (A) of the South Atlantic League…Named a SAL All-Star...His 71 walks were third most in the league, while his .397 on-base percentage was fourth...Hit .302 (49-162) with a .404 on-base percentage in 42 games prior to the All-Star break…Hit .302 (62-205) with a .421 on-base percentage in 56 road games...Went 10-17 (.588) when hitting first in the line-up...Went on the Disabled List on May 9 with a left hand contusion…Returned on May 28...Made 106 starts in centerfield…Finished with six assists and seven errors in 239 total chances...Had the majority of his at-bats in the two-hole…Hit .270 (93-345) with 22 extra-base hits (15 doubles, six triples, one home run) in that spot. Made his Single-A debut, playing the whole year with Brooklyn (A) of the New York-Penn League...Drove in a career-best six runs, August 17 at Tri-City…Hit his first professional grand slam in that game...His 40 RBI tied for fifth in the league while his 20 doubles were fourth…His 28 extra-base hits ranked third and his 46 walks were second. Made his professional debut with the GCL Mets (R) of the Gulf Coast League…Finished the season with three games with Kingsport (R) of the Appalachian League. 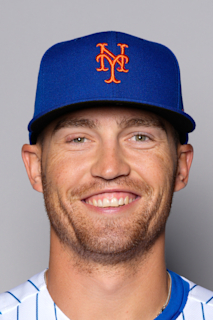 August 28, 2018 New York Mets activated CF Brandon Nimmo from the 10-day injured list. August 25, 2018 New York Mets sent RF Brandon Nimmo on a rehab assignment to St. Lucie Mets. August 20, 2018 New York Mets placed CF Brandon Nimmo on the 10-day disabled list retroactive to August 17, 2018. Bruised left index finger. April 13, 2018 New York Mets recalled CF Brandon Nimmo from Las Vegas 51s. April 10, 2018 New York Mets optioned CF Brandon Nimmo to Las Vegas 51s. July 28, 2017 Brandon Nimmo roster status changed by New York Mets. July 24, 2017 New York Mets sent OF Brandon Nimmo on a rehab assignment to Las Vegas 51s. July 8, 2017 New York Mets placed LF Brandon Nimmo on the 10-day disabled list. Partially collapsed lung. June 16, 2017 New York Mets recalled LF Brandon Nimmo from Las Vegas 51s. May 16, 2017 New York Mets optioned LF Brandon Nimmo to Las Vegas 51s. May 16, 2017 New York Mets reassigned LF Brandon Nimmo to the minor leagues. May 2, 2017 New York Mets sent OF Brandon Nimmo on a rehab assignment to Las Vegas 51s. April 26, 2017 New York Mets sent OF Brandon Nimmo on a rehab assignment to St. Lucie Mets. April 2, 2017 New York Mets placed LF Brandon Nimmo on the 10-day disabled list retroactive to March 30, 2017. Right hamstring strain. October 6, 2016 New York Mets activated LF Brandon Nimmo. October 5, 2016 New York Mets reassigned CF Brandon Nimmo to the minor leagues. September 6, 2016 New York Mets recalled CF Brandon Nimmo from Las Vegas 51s. August 10, 2016 New York Mets optioned CF Brandon Nimmo to Las Vegas 51s. August 4, 2016 New York Mets recalled Brandon Nimmo from Las Vegas 51s. August 2, 2016 New York Mets optioned CF Brandon Nimmo to Las Vegas 51s. July 29, 2016 New York Mets recalled Brandon Nimmo from Las Vegas 51s. July 18, 2016 New York Mets optioned CF Brandon Nimmo to Las Vegas 51s. June 25, 2016 New York Mets recalled Brandon Nimmo from Las Vegas 51s. March 15, 2016 New York Mets optioned CF Brandon Nimmo to Las Vegas 51s. November 20, 2015 New York Mets selected the contract of Brandon Nimmo from Las Vegas 51s. July 28, 2015 CF Brandon Nimmo assigned to Las Vegas 51s from Binghamton Mets. July 16, 2015 Binghamton Mets activated CF Brandon Nimmo from the temporarily inactive list. July 11, 2015 Binghamton Mets placed CF Brandon Nimmo on the temporarily inactive list. June 18, 2015 CF Brandon Nimmo assigned to Binghamton Mets from St. Lucie Mets. June 14, 2015 CF Brandon Nimmo assigned to St. Lucie Mets from Binghamton Mets. May 17, 2015 Binghamton Mets placed CF Brandon Nimmo on the 7-day disabled list. Left knee strain. February 3, 2015 New York Mets invited non-roster CF Brandon Nimmo to spring training. June 19, 2014 CF Brandon Nimmo assigned to Binghamton Mets from St. Lucie Mets. April 3, 2014 CF Brandon Nimmo assigned to St. Lucie Mets from Savannah Sand Gnats. February 11, 2014 New York Mets invited non-roster CF Brandon Nimmo to spring training. May 28, 2013 Savannah Sand Gnats activated CF Brandon Nimmo from the 7-day disabled list. May 7, 2013 Savannah Sand Gnats placed CF Brandon Nimmo on the 7-day disabled list. April 3, 2013 CF Brandon Nimmo assigned to Savannah Sand Gnats from Brooklyn Cyclones. March 6, 2013 OF Brandon Nimmo assigned to New York Mets. June 16, 2012 Brandon Nimmo assigned to Brooklyn Cyclones from Kingsport Mets. March 6, 2012 OF Brandon Nimmo assigned to New York Mets. August 28, 2011 Brandon Nimmo assigned to Kingsport Mets from GCL Mets. August 19, 2011 Brandon Nimmo assigned to GCL Mets. August 15, 2011 New York Mets signed OF Brandon Nimmo.